The royal family is in danger! When she arrives at the Salon-de-Provence castle, Madeleine discovers that the accident that befell Philibert the librarian was no other than a murder. 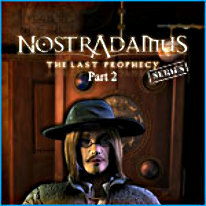 Nostradamus's prophecy is underway and suspicions are growing around Jean-Aimé de Chavigny. The royal family is in danger! Following in her father's footsteps, Madeleine must solve mysteries involving astrology and alchemy to uncover the truth. This is the second part of a three-part adventure.